​The Quintet has a large new repertoire of pop song arrangements by the brilliant young English trumpet player Seb Skelly. Songs range from the '30s to the present day, by singers such as Etta James, the Beatles, Billy Joel, the Bee Gees, Taylor Swift, Leonard Cohen, Norah Jones, Neil Diamond, Randy Newman, Bruno Mars, Lionel Richie, Queen, Vanessa Carlton, Van Morrison, the Beach Boys, Dolly Parton, Katy Perry, Otis Redding, Bill Withers, Snow Patrol, Alicia Keys, the Village People, Michael Jackson and ABBA. There are also film and video game themes, tangos and jazzy tunes. We hope to play something for everyone - although we can't play everything in the short time we have tomorrow, but we'll do what we can to get you singing and your toes tapping. 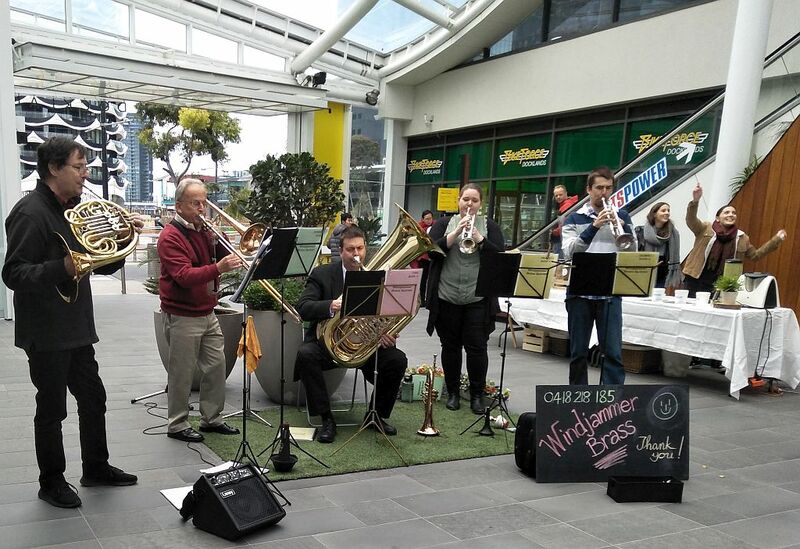 We had fun at the Makers Market in Docklands Drive, Docklands - and so did our listeners. We intend this to be the first of many playouts with this repertoire, so keep an eye (and two ears) out for us. If you'd like us to play at a function you may be having, indoors or outdoors, for any reason at all, at which you want people singing and dancing, please contact us. ​Go to our Favourite Links page and treat yourself to some of Seb Skelly's wonderful arrangements, so you can hear the sort of music we have to offer.